William Hill Poker School is your one stop shop for everything you need to know about this classic casino card game. By playing with us we will give you all the tools that you need to make the right decisions - when to raise, when to fold, when to call - to wing big! Poker is not just about luck, it is a game of strategy, percentages and nerve - using the tools at William Hill Poker will help get you started if you are a beginner and help you sharpen your skills if you are an experienced online poker player. By using the Poker School you will find you need; glossary of poker terms, tournament tips and everything else you need to raise your game. 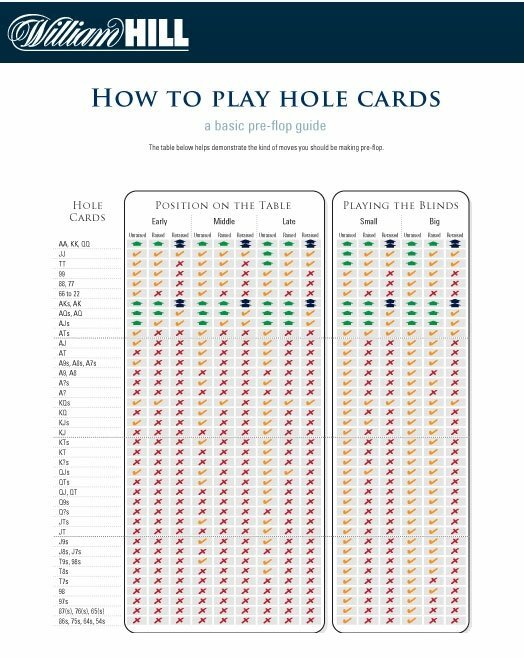 William Hill has provided all players with an easy reference Poker Hand Rankings Card. This quick reference card goes through the strength of each possible winning hand in a given poker game. By using this you will quickly learn - for example - that a flush is a better poker hand than a straight, or that a full house beats both of those. Consulting the chart is an easy way to learn the basic winning hands, and remember these Poker Hand Rankings can be applied to all online poker games such as the ever popular Texas Hold'em. So when do you play a hand? When do you fold? Well, the truth is that it is mainly up to you! But William Hill Poker School can provide you with the most beneficial info on your hand. Using this tool provides with you with a probability percentage on your hand, and thus a better insight in to the world of online poker. All the best poker players use strategy coupled with a knowledge of the probability of each hand, by using William Hill Poker School you too can have that advantage that could enable you to increase your winnings. PRE-FLOP MATCH UPS - Gives the probability of success on a range of different hands before the flop (first 3 cards drawn by the dealer). HAND IMPROVEMENTS - Gives the probability of success as the flop is dealt, and more. This handy guide will let you know the probability of success and the odds of receiving a desired hand. Another handy tool that will be useful for beginners and expert online poker players alike is the chart that gives players advice on what they should do pre-flop on a range of different hands. So say for example you receive two ace cards, you can consult the chart and see whether it is advisable to raise, check or fold. Not only that, the guide also lets you know whether it is advisable to do these things depending on your position on the table. The chart is easy to use and could be part of your winning strategy in online poker. The Poker School at William Hill is designed to offer you what you need to learn how to play poker online. Discover your new poker skills today with the help of the William Hill Poker School.